Let’s start with the absolute basics: leasing a car is similar to renting one - except that it’s for a longer, specified period of time. And like renting, you never actually have ownership of the car; you must give it back at the end of the lease. Leasing became popular in the 1990s because sticker prices made buying a car too expensive to for many people. It allows a person to drive a brand-new car while making lower monthly payments. If leasing your next vehicle sounds appealing, here are some tips to help you find and negotiate the best deal available. First of all, determine the type of car that you’re looking for. If you examine your needs as well as your wants, you’ll quickly discover the car that’s right for you. Think about what you use your car for. What type of driving do you normally do? Do you have a long daily commute to work, thus making good gas mileage a top priority? How many people will you need to transport regularly? Don’t make your choice based solely on eye-catching style or the trendy favorite of the day. Function should be at least as important as form. Once you determine the type of car that’s best for you, it’s important to find out which type of financing is most advantageous. In other words, should you really lease the vehicle, or should you buy it? Regardless of whether you decide to buy or lease your next car, establishing a realistic monthly payment amount that will fit into your budget is a very important point. A good rule-of-thumb to follow is that the total of your car payments, including all of your vehicles, should not exceed twenty percent of your take-home pay. A lease generally requires less money down and offers lower monthly payments. It also allows you to drive a new car every few years, a car that’s better than you could normally afford. And you have no trade-in hassles at the end of the lease. On the other hand, you also have no car at the end of the lease, and you’ll have to address that problem. Buying a car can demand a much larger down payment, and the monthly payments will usually be higher than leasing the same model. But at the end of the loan, you do have ownership of the vehicle. Additionally, there’s no mileage limit to be concerned with. And when interest rates are low, it makes more financial sense to own than to lease your car. Run the numbers in a Lease vs. Buy Calculator to help you determine your lease payments, and decide which avenue might be better for you. If leasing is the way to go, don’t hesitate to check various dealers’ lease specials. 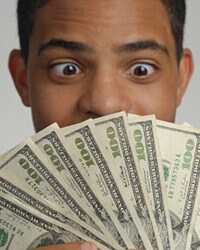 These offers can save you lots of money, but be sure to read the “fine print” carefully. Does the quoted monthly payment include sales tax and other fees? Does the advertised lease require a large down payment (which can also be called a cap reduction payment) and a security deposit? How about the annual mileage limit; is it unreasonably low? And check the length of the lease. It’s possible to lease a car for two, three, four or five years. Generally speaking, a three-year lease is the best choice because most carmakers offer three-year bumper-to-bumper warranties. With a three-year lease you’ll always be under warranty without paying the added expense of an extended service contract. Additionally, cars usually begin to show their age after about three years. And since one of the advantages of leasing is to drive a new or nearly-new vehicle continually, this lease term tends to work rather well for most people. Of course, extending the length of the lease will drop your monthly lease payment. But extending the lease also means that you'll be investing more money into a vehicle that you’ll never own (unless you choose to purchase it at the end of the lease). Concerning negotiations: always get offers from several dealerships. Once you have the lowest offer, see if the other dealers can beat it. If they can’t, it’s likely that you’ve got a decent deal. But make sure that the offer is at least reasonably close to the estimate that you made on the calculator, paying particular attention to the down payment (which should preferably be zero), the lease term, the monthly payment and the annual mileage limit. You’ll want the lease based on the market value of the car, not its Manufacturers’ Suggested Retail Price (MSRP). The market value is simply the average price that the car is selling for in your local area. And make sure that the lease agreement includes gap insurance, which will pay any difference between the amount your insurance pays and the amount you may owe the leasing company should the car be lost in an accident or stolen. Finally, remember that the car will have to be returned in good condition at the end of the lease. Make sure that all scheduled maintenance is performed on time at an authorized dealership, and be constantly aware of the odometer reading to avoid exceeding the mileage limit.